Spring/Summer 2011 Issue of South Dakota Review is Out and About! 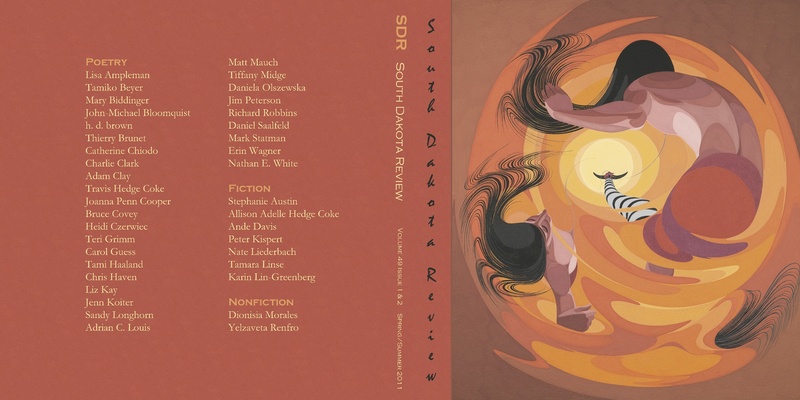 The Spring/Summer 2011 issue of South Dakota Review is out and about in its new and shiny 9×9, glossy format. Initial feedback on the redesign and content has been very positive so far from SDR’s contributors and subscribers. We hope you enjoy the issue! South Dakota Review is going through an ambitious and exciting period of transition/transformation. Reader, would you consider showing your support for us in one or more of the following ways? I like the new format, but I’m a long-time reader of SDR and I’m disappointed by the lack of archives going back further than the recent editorship. I wanted to use an essay of Brian Bedard’s for my students from a few years back and it used to be archived with quite a few other works I liked to go back and read, but all of those older archives seem to have disappeared. I think some history and continuity is lost this way. Would it be possible to put the other pages back up? I enjoy SDR now but I used to teach a number of poets and essayists whose works were online. And some of the special issues were brilliant, what parts were available online. Now they have been disappeared. SDR has a long history and I think the archives should reflect that. Thanks for much for doing that for your long-time (old) readers. Thank you, but the essays I wanted were posted several years earlier. Hawk on the Goal Post, and one about a stuffed buffalo…there were interviews with poets, too, in an issue I used. I thought you and your father were in that issue. Next Next post: Fall 2011 Issue of South Dakota Review in the Mail!